Prominent & Leading Manufacturer from Delhi, we offer bucket elevators and bucket elevator. Backed by rich industry experience, we are presenting vast variety of Bucket Elevators. Widely demanded by customers throughout the nation, these products are available in different specifications at reasonable prices. Also, our expert quality controllers thoroughly check all the products on various parameters to ensure flawlessness. Bucket elevators have been used for vertical transport of diverse bulk materials for decades. As a market leader, Rollcon Technofab India Pvt Ltd have successfully fabricated belt bucket elevators for different industries decades ago. Belt bucket elevators are consistently developed in the past and enable the highest possible conveying capacities with maximum centre distances today. These type of conveyors are mainly used where there is limited space is available. A bucket elevator can elevate a variety of bulk materials from light to heavy and from fine to large lumps. Nearly all centrifugal discharge elevators have spaced buckets with rounded bottoms. They pick up their load from a boot, a pit, or a pile of material at the foot pulley. Chain bucket elevators are the preferred conveying systems for the transport of hot bulk materials and coarse-grained materials. RTIPL offers efficient and proven solutions even for the highest conveying capacities. 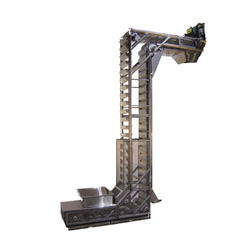 Because every bucket application is unique, our company offers a broad series of industrial elevator designs. Selection of the proper type of bucket elevator depends largely on the capacity requirements and the characteristics of the material to be handled. Looking for Bucket Elevators ?